Higher wages and pensions, increased allowances, well-repaired roads, and various programs to improve the medical system. These are just some of the achievements of the Government of Filip in three years of activity, presented today by the Prime Minister. 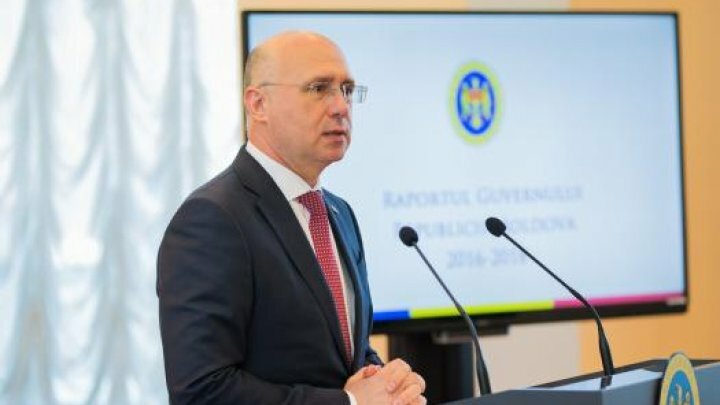 According to the Prime Minister, during this period, the economy grew considerably, and the business environment became more attractive for both Moldovan entrepreneurs and foreign investors. Thank you for coming to today's event. Within a few days, it will mark three years since this Government took office and it's foremost to present a report in front of all citizens. Meanwhile, we have invited today some representatives of those, we believe, benefiting directly from our programs and decisions. They're representatives of business associations, trade unions, academia, local authorities, civil society, and government program beneficiaries. I will brief some of the Government's achievements, which we consider to be more important, because we have had difficulty trying to synthesize everything done in three years. There are many achievements and I am glad that they are all proven by concrete figures and results in statistical data, graphs, evolution. Sincerely, I understand very well what were the expectations for us when I was elected in the Government. I know people distrust the new Government. I came to power after 2015, when we had three prime ministers in office and two interim officials. I understand why people gave us slim chances. But after 2015, the period we had three governments in less than a year, we had a government for three years. I am sure that one of the good things we have done is that we have brought stability and peace to the country. After a period of many crises and disturbances, for 3 years we have a steady growth in most of the sectors in Moldova, an increase that will continue in the next years. That is why I know that this Government did not have the privilege of others to come to power on a wave of enthusiasm and populist statements. The period we took office was complicated for our country, and we understood very quickly that we had to start working, that people had already deceived a few times with words and statements, so we have to give them facts. They must feel the changes in their pockets and with dwellings. I believe we have succeeded in achieving some of the goals we set. I will mention, hopefully briefly, the most important developments in different sectors, compared to previous years. One of my prides is that we managed to increase people's incomes not through populist statements but through changes and reforms that have brought equity and balance to the system. Since 1 December 2018, the salaries of all public servants became higher as a result of wage reform. No one will earn less than 2000 lei monthly. People will receive increasing salaries in January and I hope the money in pockets will end all speculation on this subject. Others may major in declaring statements, we here work with figures. I will only show you few of them. Wages in education were raised in 3 years by 84%. In 2015, 3 years ago, the average salary in education was 3600 lei. This year the salary will reach almost 7,000 lei. In medicine sector, we have a 83% increase in doctors' salaries, which have evolved from 5,000 lei in 2015 to over 9,000 lei after wage reform. Recently, I have marked the day of Culture and I can say that after the reform, wages in this area will grow even more. For example, the salaries of the directors of cultural houses have tripled from 2000 to 6600. We have decided to increase salaries for the 5,000 postmen and employees of the Post Office of Moldova. Some of them will also receive 2 times more than now. There are a few categories that have been ignored so far, but I'm sure that people will feel the changes soon, as we can see on paper when we make calculations. For example, the figures show that in 3 years the average salary rose from 4600 lei to almost 7000 lei. Modestly, I think this is great result. We also took care of retirees, but we first brought equity into the retirement system through pension reform. We have introduced a new calculation formula that brings pensions 30% higher to those who have retired starting in 2018. Yes, I admit it. I still believe that the pension in the Republic of Moldova is very low. But we have made efforts to increase it. In 3 years the average pension increased by almost 50%. It's a record, shows the data. Starting from January 1, pensions were raised by 10% for half a million pensioners, the average pension reaching up to almost 1800 lei, comparing over 1000 lei three years ago. Starting January 1, 2019, the recalculation of pensions for those who work after retirement has been launched, followed by indexing, so for some people they will even double. More than 603,000 people have received for the first time a 600 lei support, and I am pleased to see people take this initiative positively. We have increased the monthly allowances for deportees from 100 to 500 lei and the unique material aid - from 700 to 1000 lei. Everyone is entitled to free prophylactic medical examinations at the State Chancellery Hospital and benefits from reductions in health rehabilitation services. We have increased 2 times the unique childbirth allowance from 3000 to over 6000 lei. We have raised from 30 to 120 thousand lei the allowances for young pedagogues. From 2012 to 2015, the school-based allowance per student has increased by ... just 50 bani. In 3 years of government, we have increased this amount seven times more than it was at that time. Infrastructure has been actually a national priority, because in the 21st century we want to say that we are a European country not only geographically but also in terms of infrastructure. We launched the most extensive road repair program. Only in 2018 we repaired 1600 km of roads. For comparison, between 2009 and 2015, an average of 140 km per year were repaired. We made roads in villages, where were permanently neglected. I talk about this as not a praise, but great sadness, because if they had repaired yearly at least half of what we rebuilt, the whole country would have been covered today by good roads. We will continue this program in 2019 with another 2600 kilometers. The plan for this is in progress now after its approval. We have the necessary money, new roads will be built as soon as it gets warmer. Work has also been done on the water and sewerage infrastructure segment. In the past two years, over 106,000 beneficiaries have connected to the water network, which means 53,000 people per year, seven times more than during previous governments. For 2019, we set more ambitious goal: 100,000 people have access to water network. Last year we bought 110 new ambulances, other 170 ones are to be purchased this year. Starting December 2018, each new mother receives free boxes of necessity for newborn babies under the government program A New Life. Only in December 3000 mothers were presented this present. First House program is a program I'm enormously proud of, a program was drawn up in 2017 and initially criticized. However, 1200 families managed to buy houses with government support. We plan for 2019 other 3000 apartments, 3000 young people. Another program - A Doctor for you campaign is program I am also pleased. We speak of mixed teams of specialists, lung screening, dental checkups for babies and mammograms. There are people who were 10 or maybe 20 years old under medical supervision to prevent a disease. I'm glad that 40,000 people were examined for free. People's health is a priority for us. We have several successful programs to support entrepreneurs. These are advance grants in agriculture for young people and women, Women in Business, START for young people, PARE 1 + 1, DAR 1 + 3. Economic stability has been brought to our country which is undeniable. After the 2015 crisis - the GDP fell by 0.5%, in 2016 we put the Republic of Moldova on an upward trend and our country entered a new economic cycle. We have a steady economic growth of over 4 percent. Which is one of the highest rhythms of growth in the region. Due to the reforms we have made to stimulate the business environment, we have indicators to prove that we are on the right pathway. We reduced the bureaucracy and offered the possibility that all the documents were requested online, we reduced the taxes (we reduced the income tax to 12%, we reduced the VAT for the HORECA industry), cut from the pressure on the economic agents. Business associations say that they feel relieved since we are in government. As a result, the budget got more than 15 billion lei. We can use some money that came in the budget to increase salary, pension, government programs. We have 350 IT park residents who pay a single 7% tax. According to the data, half decrease of salary under the table receivers was recorded within a year. Exports grow steadily, only in the first half of 2018 - by 30%, to 1.5 billion dollars. 70 percent of these go to the European Union. Only in the Free Economic Zones we have invested $ 160 million and 7500 newly created jobs in the last 3 years, twice as much as before 2016. 170 thousand jobs were created in 3 years, says the reports from the economic agents. Investments, well paid jobs, higher incomes - we have to prove well-being to convince people stay home. Moreover, we also took important steps to secure the borders. We have a project which is underestimated now but people will realize its importance. I refer to the fact that during the mandate of this Government, for the first time since 1992, the Chisinau authorities can fully control the border of the country, including the Transnistrian segment, an achievement that we consider crucial, obtained with the help of our colleagues in Kiev which provide joint border control. The Iasi-Ungheni-Chisinau gas pipeline is also a government priority regarding energy security. During the mandate, the Control Center for the Iasi-Ungheni section was built and the design works for the Ungheni-Chisinau section were completed. I am confident that by the end of 2019 this pipeline will be able to provide our country with all its natural gas needs. The interconnection of electricity will be ready in 2-3 years. For security and defense, we launched the Professional Army program and we decided that the military service would no longer be compulsory so that we have well-trained military personnel. With the help and support of the Ukrainian partners and authorities, we have also made good progress on the Transnistrian dimension. This year, we have repeatedly asked, on the UN tribunal, the withdrawal of Russian troops from the territory of our country. Farmers can take their lands. We also resolved the issue of schools. We have allocated 15 million lei for the development of schools and infrastructure in the Transnistrian region, including 100,000 lei for each of the eight schools with Latin-language teaching. Next, we remain focused on the European vector, our goal is to bring our citizens a European standard of living, European salaries and pensions, modern infrastructure and living conditions just like in the Member States. The accession to the European Union and the Association Agreement remain the compass according to which we aim and harmonize all the actions. We also have good relations with other countries, 43 free trade agreements signed with various countries. We count on the support of the United States, a strategic partner for our country. We have excellent relations with our neighbors in Bucharest and Kiev. We have a joint road map with Romania through which we will monitor all the interconnection projects we have agreed on. We also count on Bucharest's support in the context in which Romania recently took over the presidency of the EU Council. Honestly I'm still unsatisfied with what we've done in these years. We could have worked as efficiently as last year when we started the most important projects and important results showed up. Additionally, I'm aware that the years 2016-2017 were essential for stabilizing the country and increasing budget revenues, however we could not make new roads, increase wages and pensions, invest in dwellings and others. Yes, maybe it could have been more if we started in 2015 from something, not from regressions in all areas. Within three years, we have done lots remarkable achievements more than the previous governments in all sectors, according to the figures. But the Republic of Moldova still needs to be pragmatically governed, with a clear focus on achieving results for citizens and improving their lives. I was glad to see in the polls, but also in the territory, most people say many good things were done in this period. It is the most important appreciation for us from our people. We have sometimes been accused by the opposition that we came with increase in the electoral year. It is important to understand that we have taken the government in disaster in 2016. In 2017 we started to make changes to bring us money to the budget. We had bigger receipts in 2018, and they allowed us to make investments, to come up with salary increases, pensions and social allowances. It is a natural evolution. These increases and investments will continue in 2019, I assure you. At the same time, as Prime Minister, I would like a stronger opposition that initiate ideas, require more, criticize and prove they have better solutions. I did not have this, for three years I did not have the opposition. I do not know whether we should enjoy it or not. Perhaps this has relieved our work and relieved the people. Because people can make the difference between facts and words. People let go of emotions, but know to discern between those who promise and destroy with those who built and promise to build. People are good when there is a strong team, who can work, or when there are politicians who are only good at conducting press conferences. I have been part of an extraordinary team in these 3 years of work and I want to thank them today. Only together we were able to do these things. I'm sure we're not getting so easy. We still have a lot of work to do. The Government will continue to work at full capacity and produce results for people. I believe lots of beautiful things await us ahead.